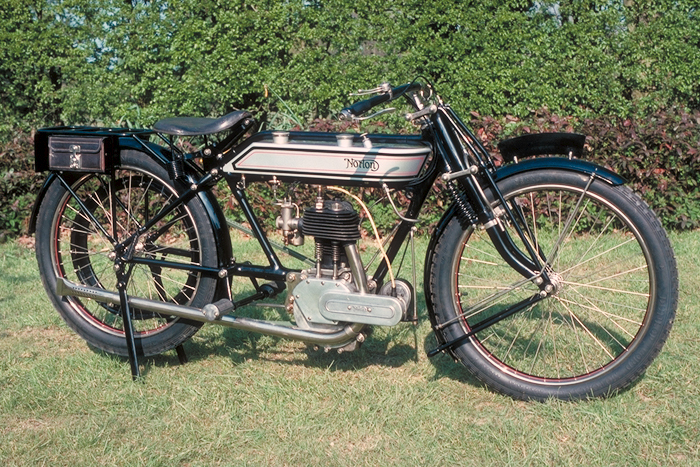 This model (Model 1) was launched in 1908, and was the first Norton machine to incorporate a Norton manufactured engine, previous ones having been bought in from other sources such as Peugeot. The engine was a side-valve one, with a characteristic cylindrical silencer which lay across the front of the engine. It started out as a belt drive machine but gained a chain in 1915. There were various modifications to the design, particularly for 1931 when, amongst other things, dry sump lubrication was introduced and the front mounted magneto was moved to the rear. The right hand side exhaust system was adopted in 1932 and a four speed gearbox was optional for the following year. 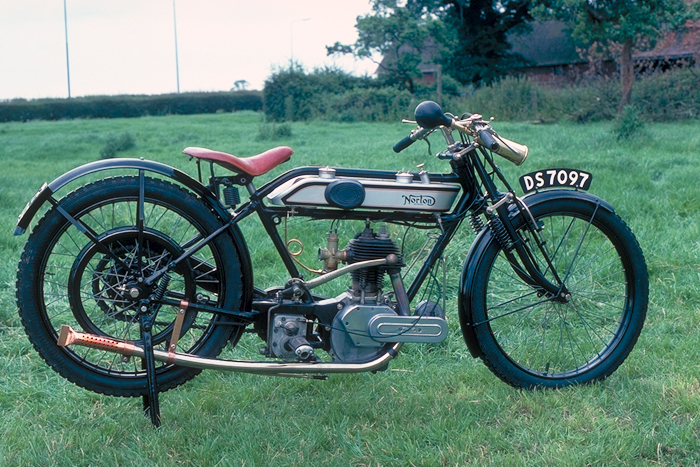 The Big 4 was a particular favourite of James Norton himself and in the early '20s he toured South Africa on a Big 4 combination, covering several thousand miles and hoping that the fresh air away from the industrial grime of Birmingham would improve his ailing health. Ideas for machine improvements were incorporated on his return to England. Like the 16H, these machines were also used in the war and both there and in civilian use could frequently be seen with a sidecar attached. From 1948, the original 82mm x 120mm engine dimensions (633cc) were reduced to 82mm x 113mm (596cc). 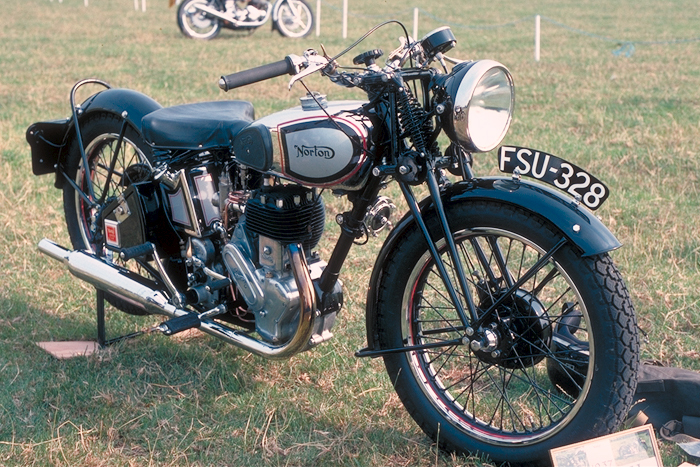 Developments ran side by side with the 16H, both machines having the laid down gearbox from 1950; better brakes and a petrol tank increased in capacity from 2.75 gallons to 3.5 gallons in 1951; a long awaited change from a saddle to a dual seat in 1953; and an 8" front brake in the following year. Power output from the later versions reached 14 b.h.p., from a machine weighing 413 lbs. In 1954, production of the Big 4 (and its 490cc counterpart, the Model 16H) ceased as the popularity of side valve machines waned rapidly. It had been manufactured for over 40 years unbroken by wartime, albeit in a number of quite different forms. At first glance, the unwitting observer could be fooled into thinking that the Model 9 is an early example of the well known 16H. Although using the same engine, the frame differs markedly from that of its contemporary. The belt drive Model 9 is without both a clutch and a gearbox, though it does have a slight variation of drive ratio by means of the automatic Philipson governor pulley on the crankshaft. Owing to the non-auto carburettor, the throttle and air levers have to be juggled with at the same time when riding! The brakes are of a rudimentary bicycle design. Even in 1920, this machine was well out of date and it was to remain available until 1922. 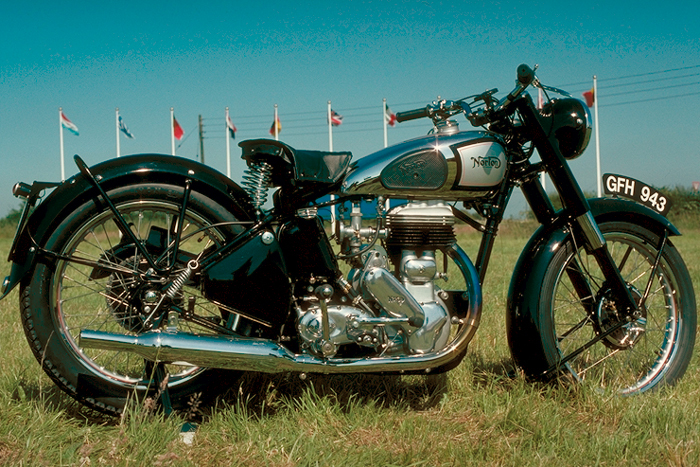 This Norton is a very rare one indeed; the whereabouts of only a handful being known. Very similar to the Big 4 but with a smaller engine based on the already traditional Norton dimensions of 79mm x 100mm. Initially, owners had to file the valve stems in order to obtain the correct tappet clearance, but in 1922 adjusters were fitted. 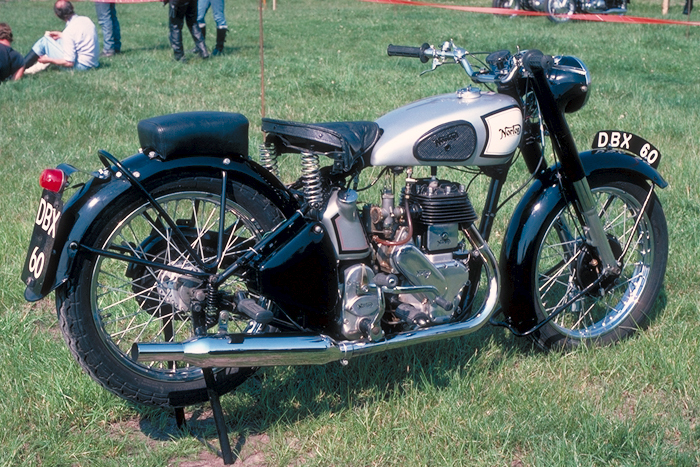 Whereas the Model 16, already in production, had a frame identical to the Big 4 with high ground clearance, it was decided to build a version with a lower ground clearance frame. This became the 'Home' model, the Model 16H while the high ground clearance version became the 'Colonial' model, the Model 17C. The engine was a side-valve design with external valve gear although this was enclosed post-war. The flat tank was replaced in 1929 by a saddle tank and over the years there were several frame changes. 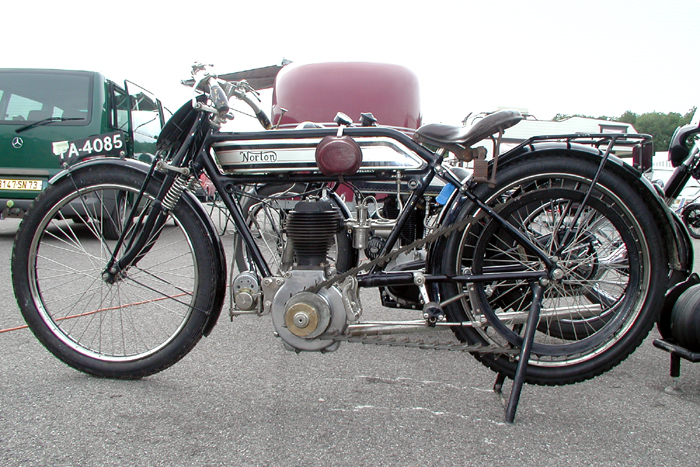 For 1932, the exhaust pipe changed position to the right hand side and in 1935, a four speed gearbox was fitted, which had already been on some other Norton models for several years. The 1938 version also distinguished itself with what is generally considered to be the most hideous silencer ever fitted to a motorcycle, the infamous 'cow's udder'. Over 100,000 of the WD version of the 16H were manufactured before and during the 2nd. World War. 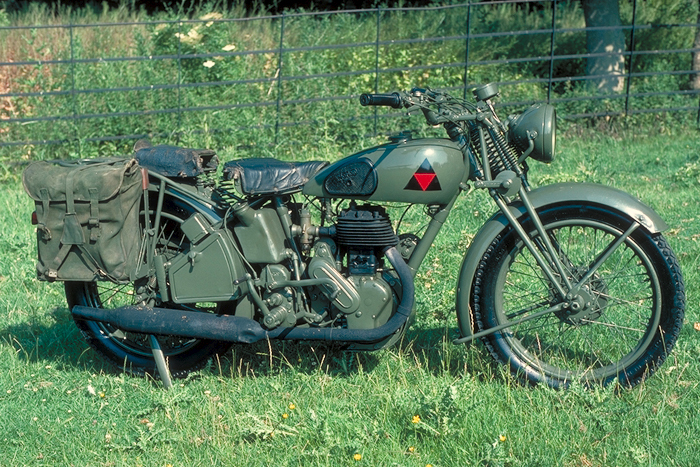 The chosen design was based on the 1937 civilian 16H with open valve gear, the higher clearance trials frame, a crankcase shield, buffer stops on the forks and lower overall gearing. The 16H had the virtues of being cheap to produce, and capable of taking a lot of abuse from riders and mechanics alike. Nothing on it was new or unproven, the basic engine design going back over twenty years. The colour of the paintwork depended on the branch of the services that the machine belonged to, dark blue for the Navy, light blue for the RAF, and olive green or khaki camouflage for the Army. Ex-WD 16Hs were resprayed and sold after the war to civilians and many were used with sidecars. 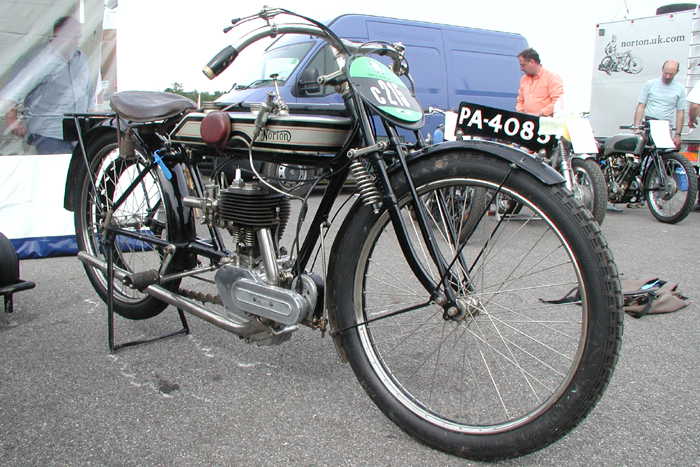 Girder forks were retained through to 1947, when the new models had some design changes, including Roadholder forks, new valve gear and an alloy cylinder head but still without a head steady.